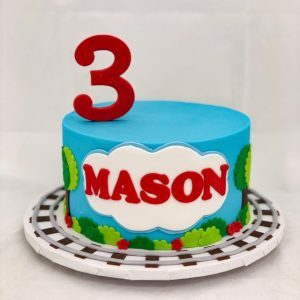 Not all cute cakes have to be multiple tiers of involve lots of piping and 3D accents and this cake for Mr. Mason’s 3rd birthday is the perfect example of that! Mason’s party theme was Thomas the Tank Engine…so fun! Thomas, however, happens to be a copyright protected character, which means that we cannot recreate Thomas out of icing because we don’t own the rights to his likeness. But that doesn’t have to stop Mason from having a super cute cake! For this cake, we iced the cake in a base coat of sky blue buttercream. We added trees and other landscape scenery similar to what you might see during a ride on Thomas. We then added a jumbo cloud with Mason’s name. One the cake board, we added a train track for Mason’s Mom to put some toy trains on. Lastly, we made a large #3 fondant topper, which was made ahead if time, so it would hold it’s shape. We cut out the fondant 3 and skewered it, so it could be placed in the cake once it was dry. We set it off-center because Mason’s mom is going to add a Thomas toy on top as well. 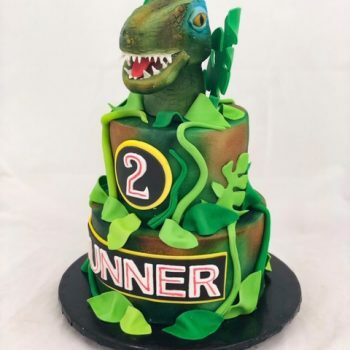 Because the toy is purchased directly from the store it can be used on the cake without us having to violate federal copyright. AND Mason has a new toy to play with once the cake is eaten. It’s a WIN-WIN! !